Black Legion Undead Cleaver Machete | BUDK.com - Knives & Swords At The Lowest Prices! Woe be unto any zombie that dares to approach this powerful Undead Cleaver Machete, only from Black Legion! You can slash your way right through the zombie apocalypse without batting an eye or breaking a sweat with this beast of a blade! I just got this new Undead Cleaver, and it works very well- and it has a great feel to it. I rate this tool 5 out of 5 stars. The machete is very nice and basically a lawn mower blade. The only problem is, under the green cordage is a weld line so what i did is went to lowes and bought some Fiber-fix (an amazing fiberglass wrap that has improved many of my budk purchases) and put that over the weld line and the handle so now if needed I can use two hands to swing it because I used the biggest size they sold. I also was using it to clear brush and hit a steel I-beam that was in my yard (don't ask) and when it hit the beam the blade came away unscathed and the beam had a cut about the thickness of a quarter and about as deep as my pinky fingernail in it! If you want a badass machete, this is it after a little improvement! I got this machete yesterday and decided to try it out today on a small tree to see how well it would cut as compared to a machete I purchased from Lowe's last week for the same purpose. I wasn't very impressed with the sharpness of the Black Legion when I unboxed it. Boy was I wrong! The Black Legion Clever Machete chopped thru my 2 inch diameter tree in 2 swings. My very sharp Lowe's took several swings to cut thru a similar tree nearby. I was so impressed with the Black Legions performance on my test tree that I ended up quickly clearing several other nuisance trees. When I finished, the Black Legion didn't even look like I had just used it for the last fifteen minutes. Very impressive performance! I will be using the Black Legion machete exclusively for the rest of my yard work. This machete is amazing! I knew it'd be sharp, but never this sharp! Amazing weight and good size! BudK never disappoints me! Welded tang, not a true full tang blade. Remove the green cord and you'll see the weld line. Yes it's only a $16.99 blade but don't be deceptive in your descriptions, "Powerful full-tang construction" NOT! 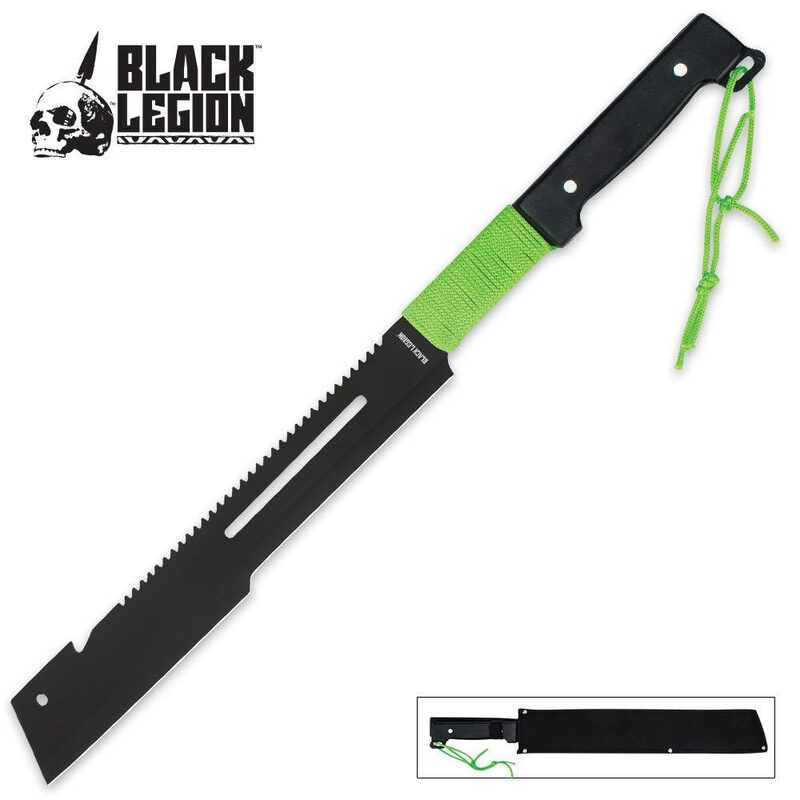 Black Legion does make some nice $20 or less Machetes, this isn't one of them.